The 3.7.0 release provides a number of important features. Single Sign On (SSO) allows your users to seamlessly access your network with their stored credentials. Mac users can be authenticated with SSO as well. And even if authentication fails, the appliance will still fall back to IP based policy. Captive Portal allows access to browsing through a configurable authentication web page where users can enter their Active Directory credentials. You can also configure captive portal to allow guest users to log in and use your network. Authentication Profiles allow you to apply different types of authentication in order to create highly granular access control. Each authentication profile requires one or more connection profiles, another new feature of this release. If authentication fails for any reason, you can configure your appliance to either block access, or use IP-based policy rules. On the Configuration > System > Connection Profiles page, you will find the new connection profiles feature. 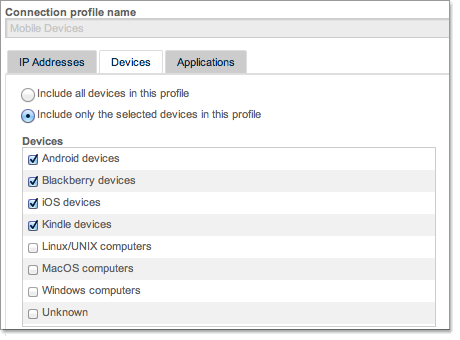 Connection profiles let you manage access based on IP address, device type, application, or any combination of those. Use these with authentication profiles to create fine-tuned access configurations.